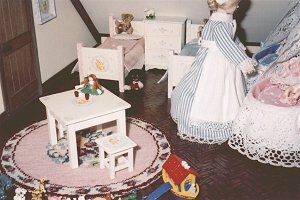 Caroline W, who lives in Thorpe Bay, Essex, sent these photos of her dollshouse. She has quite a collection of finished miniature needlepoint items, now, all over her doll’s house. These were all stitched by Caroline’s mother-in-law, who is still stitching – in her 80’s ! 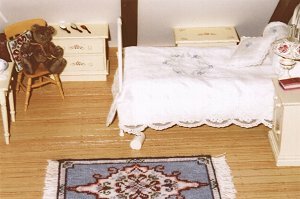 This shows the “Barbara (green)” miniature carpet design in the staircarpet version and the small rug version. 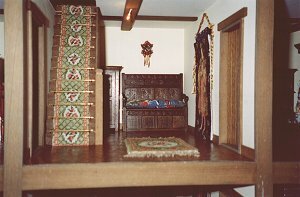 There is also a ‘Cluny Merchant ‘ Tudor doll’s house wallhanging by the door on the right of the picture. 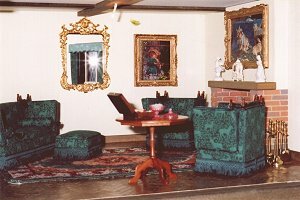 Here, the same ‘Barbara (green)’ doll’s house carpet design is shown in the large version , along with the matching miniature footstool and cushion. This shows clearly how matching designs stitched on different counts of fabric co-ordinate really well together – the carpet is stitched on 18 count canvas, the cushion on 22 count canvas, and the footstool on 28 count evenweave fabric. The circular Bella dollshouse carpet, just six inches in diameter, although often used in parlours and boudoirs, looks just as much at home in this pretty nursery. The deep tones of the jade green armchairs are set off by the “Jill” Oriental-style miniature carpet (no longer available) in this living room. Despite being one of the largest carpets that we produce, this is one of the most stunning when finished, and Caroline’s mother-in-law has really done it justice! 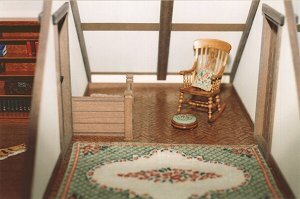 The little “Sophie” dollshouse rug fits in well in this tiny attic room. An ideal beginner’s project, this little carpet takes only a few hours to make, yet, as you can see, looks great when finished. 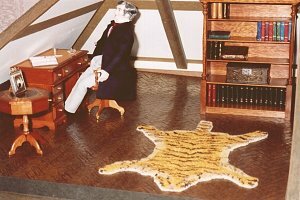 The “Tigerskin” miniature rug is well suited to the formal look of this study. Based on the markings of a once-living real tiger, this carpet kit, signifying the epitome of Victorian domestic style, adds a certain air to this room.